Renowned speakers presented innovative and modern ideas on hospitality during the three days of the Xenia trade show, at a specially-designed stage within the impressive Hotel Megatrends project in Hall 1. From the very first day of the Xenia 2018 trade show, the Hotel Megatrends/Talks stage in the impressive Hotel Megatrends project in Hall 1, arrested the attention of hoteliers from all across Greece. Distinguished experts introduced to visitors a variety of projects and showcased important aspects of the modern hotel culture. The program was off to a dynamic start from day one and the Hotel Megatrends official presentation by Thodoris Makridis (Makridis Associates), Nikolaos Koukos (ΚΑΥΚΑΣ), Vassiliki Karadimou (LG Electronic Hellas), Vassilis Vlachogiannis (VITEX), Alexis Christodoulakis (IT CONCEPT) and Stavros Mavridis (EFZIN) coordinated by the Hotel Megatrends project manager, Kostas Koutsantonakis. The presentation was followed by an interesting debate with speakers answering questions regarding the latest trends in hotel investments. Ria Vogiatzi from Elastic Architects spoke about the investment trends and the strategic renovation of the urban hotel, while, later on, Ilias Mastrominas from Mastrominas Architecture analyzed architecture as a lever for the development of high-performance tourism investments. Specifically, he stressed the importance to return to a genuine architectural experience combined with a holistic approach to architectural design. Of particular interest was also the speech by Thomas Gravanis (Founder L + DG) on lighting as a tool for boosting hotel identity and giving added value to tourism accommodation. In addition, visitors had the opportunity to follow a speech by Christos Andreopoulos Head of IT for the Oetker Collection on technology as a key business and cost factor, and in particular, the case of “High Touch vs High Tech” –namely, how hotels interpret and can combine technology with high aesthetics– in luxury hotels, as well as a commentary by Thanos Skoulikakis (Pylones Hellas SA) on Wi-Fi a hotel evaluation factor by its customers. Panel discussion about Hotel investments in Greece. 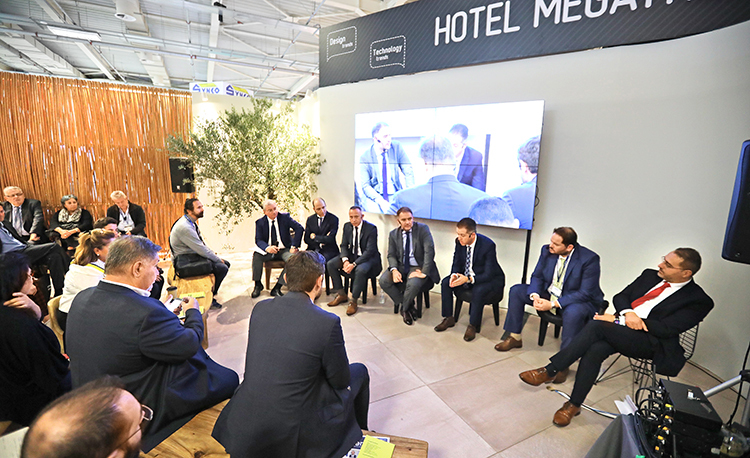 A number of leading hospitality experts took the stage of the Hotel Megatrends Talks during the second day of the Xenia trade show. The presentation started with a discussion on Hotel Investments in Greece by a panel of distinguished experts: Mr Alexandros Vassilikos, President of the Hellenic Chamber of Hotels (HCH), who stressed the need for hotels to give added value to the respective tourism destination; Mr Grigoris Tassios, President of the Hellenic Federation of Hoteliers, who expressed his optimist on the future of the sector and its economic growth; Mr Haris Siganos, CEO of Zeus International and strategic partner at Wyndham Group of Hotels, Mr Spiros Venetsianos, Deputy General Manager, Head of Structured Finance Group Corporate & Investment Banking at Eurobank Ergasias SA, Mr Ioannis Kallias, CEO at TUV Austria Hellas, and Mr Manolis Koutelias, Head of Investment Projects Department at Noisis Development Consultants SA, elaborated on the opportunities and challenges faced by entrepreneurs wishing to invest in the Greek hospitality industry, as well as the NSFR programs. Later on, the main topic of the program shifted to wellness, with experts talking about the latest trends in wellbeing, why it is a major requirement for the modern traveler and how to build an effective wellness program in hotels. In addition, Ms Ariadne Diamanti of Ariande Athens Spa Products, elaborated on the treasures of the Greek land and suggested a new concept of luxury in spas, James Blower of Matrix AMEA & APAC reviewed world trends in fitness, while Natassa Karatza of Eurotel talked about trends in mobile technology and wellbeing applications for hotels. Finally, the day’s packed program concluded with a panel discussion on Tourist Start Ups, with speakers examining the role of technology as a means of connecting the traveler with the hotelier and the local community, as well as the valuable contribution of Greek start-ups to the development of domestic tourism. Sustainability and tourism, landscape architecture and environmental impact, smart solutions and energy saving practices, and the future of tourism through the eyes of a series of young and talented Greek architects were the major topics of the day. Specifically, Dr Ioannis Pappas (Mediterranean Region at GSTC) discussed the future of tourism through certified sustainable destinations, while Dimitris Botzis (D. Botzis Engineers) talked about techniques and systems for saving water and energy in Greek hotels. Shortly after, Antonis Gavalas (Gavalas Architecture) expressed his opinions on bioclimatic tourism which were followed by a heated debate among participants. The contribution of landscape architecture to the upgrade of hotels and tourism accommodation was the topic dicussed by Katerina Goltsiou, President of the Panhellenic Association of Landscape Architects, whereas Antonis Skordilis of Ecoscapes spoke about the modern perception of experiential hospitality through the creation of special landscapes in city hotels and resorts. Ms Eleni Tsirintani(Elandscape) spoke about experiencing nature in nature-based tourism accommodation, while Mr Grigoris Kotopoulis (Egreen) talked about the effective contribution of modern water management techniques for the improvement of thermal comfort. During the second section of the day, moderated by Antonis Gavalas of Gavalas Architects, a panel of experts, including Nikolaos Pavlos (Kafkas) and Christos Ghekas (LG Electronics) discussed modern energy saving products and innovative solutions for hotel units and tourism accommodation. 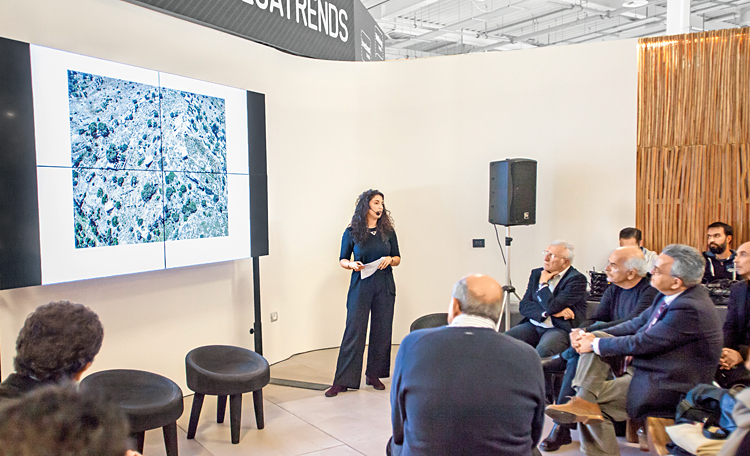 Finally, during the third section of the day, Irene Markantonatou (Fiore Architects) and Manolis Iliakis made short presentations entitled “Conversing with the Landscape” and “Pi Athens: a hotel in the area of Kallimarmaro”, respectively. Later on, Iliana Kerestentzi talked about the modern traveler and the quest for an immersive experience based on location and authenticity, Leonidas Paplambropoulos discussed what lies beyond the “Recovery Principle”, `Myrto Kiourti dissected the hotel-settlement Mama Chora, and Aristides Dallas gave a lecture on planning tourist attractions and when the hotel itself becomes the destination. Hotel Megatrend/Talks and its comprehensive three-day program managed to leave behind a great store for all Hospitality businesses, both at an innovative, environmentally-friendly and user-friendly solutions level, as well as in how architectural thought for Hotels is shaped in today’s Greece. Xenia promotional budget The advertising expense will reach € 400,000. Hotel Megatrends / Talks Leading keynote speakers will talk about the future of Greek Tourism.